The Beatles live at Candlestick Park, San Francisco, 1966. Recently some hitherto not publicly available colour amateur film footage from The Beatles' final concert was uploaded to YouTube. 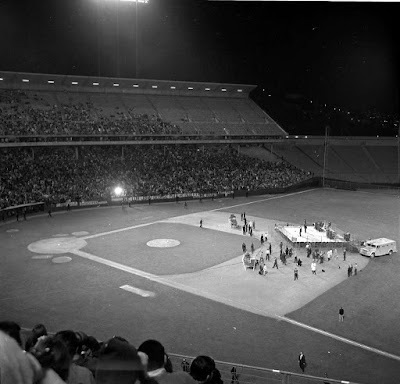 As you probably know, that final concert took place on the field of San Francisco's Candlestick Park, which was demolished a few years ago. Still silent, it's a well known fact that at the last minute, Paul McCartney asked their publicist Tony Barrow to record the performance on a little cassette recorder. The tape ran out during their final song, "Long Tall Sally". Barrow's recording can be found here. The concert was held on August 30, 1966.